In this beautiful holiday season, I am truly hoping you have a moment for yourself – even in the middle of busy time. Treat yourself with quiet time by walking in a park, looking up at night sky (Stars looks clearer in winter!) and going out to explore new things. Stop by new galleries to you :). Hope arts brighten your holiday & winter season, and give you peace, joy, fun, energy, inspiration, hope and new perspective for your next year and forward! Currently, my works are on view at the following galleries. 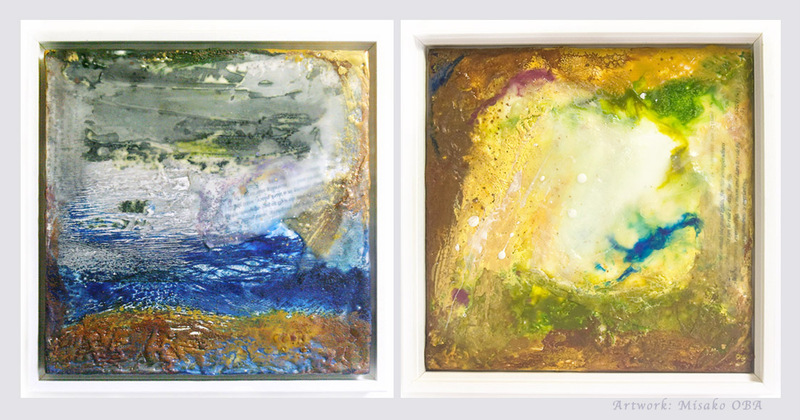 They are encaustic mixed media paintings from my on-going “Stars and Desert” series. However, for the first time, I am showing the work with the “code.” Code that has something to do with stars! It is somehow abstract. My works are often semi-abstract, I would say. It took me a quite long time to figure out what/which code to put. It’s finally done with a help of my friend who is a talented Software Developer. 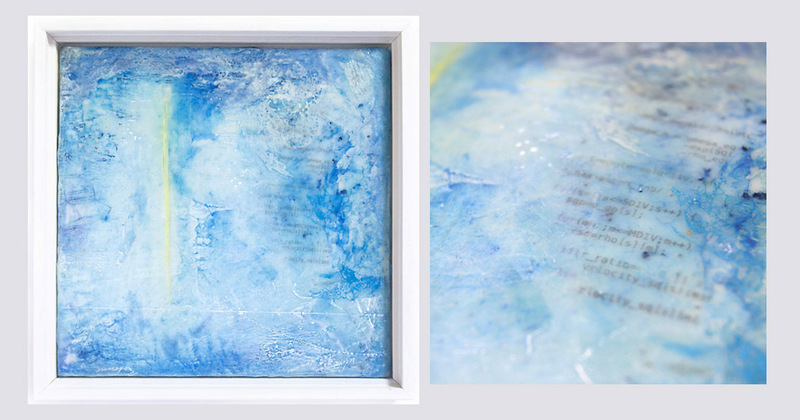 “Illusion,” Misako Oba, Encaustic mixed media on wood. 9x9x 1.5 inch (left: framed). Details of the work. Code shown (right). 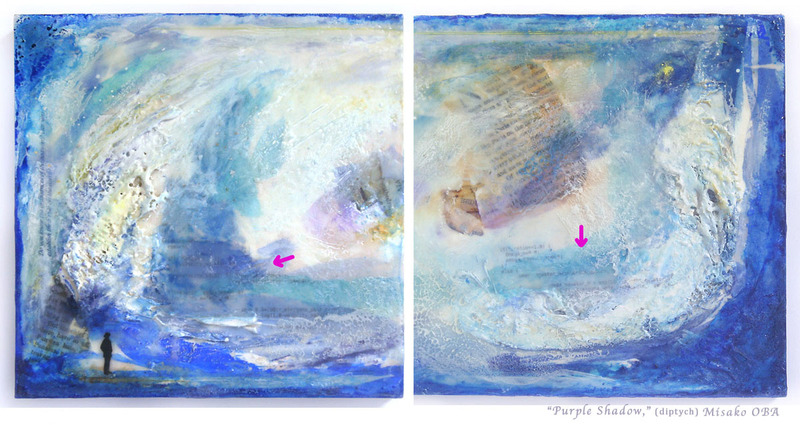 “Purple Shadow” – Job 38:33, Misako Oba, Encaustic mixed media on braced wood. 16.5x8x1inch. Featured Artists: Erin Anderson, Noah Buchanan, Janet Cook, Seth Foss, Max Ginsburg, David Kassan, Nikolina Kovalenko, Yuri Leonov, Shana Levenson, Travis Little, Stefano Losi, Hilary McCarthy, Rachel Meuler, Misako Oba, Robert Pillsbury, Edmond Rochat, Joshua Schaefer, Billy Seccombe, Errol Smith, Patricia Watwood, Stephen Yavorski and Leah Yerpe. “Love Flowing II” Details of the work. Code shown (right). As I previously wrote, the “Stars and Desert” Series was developed after moving to Seattle, WA from New York, NY. I have been creating art (encaustic mixed media paintings on wood panel, printmaking, works on paper and canvas) with Text that has something to do with stars, constellation, desert, and universe, in abstract way. Text from the Bible interests me because of its insight and depth meaning. As a contemporary artist, I always try to push the boundary and wanted to include something very current or something that is reflecting our time. – As I have lived in Seattle, I started to feel more connected to computer related people or its environment, partly because the Seattle area is a place where lots of computer related professionals come to live and work. It has Headquarters of Microsoft and Amazon, and after moving in to Seattle from NY, I naturally got friends who are in the industry. In our time, we somehow cannot live without any types of computer/devices/equipment anymore since they are deeply or lightly related to our daily life…in a good way or bad way. Thus, I wanted to include something that reflects this to my series. 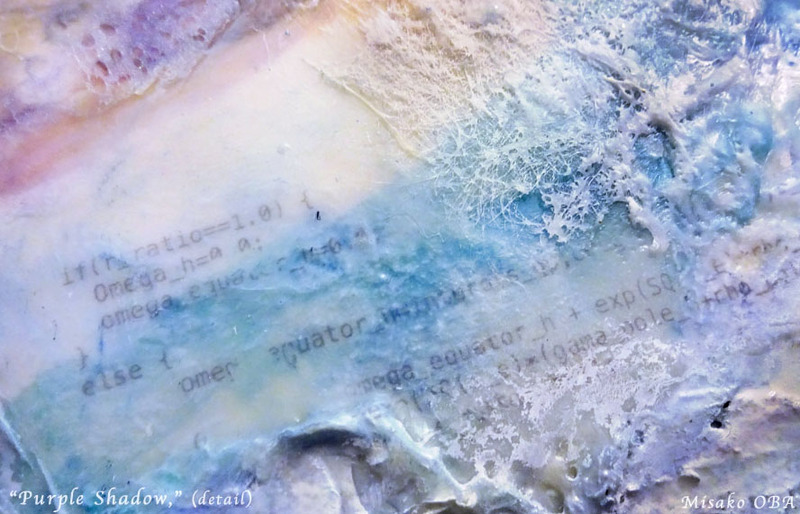 I was already using some scientific or mathematical formulas in my art, but I also began to want to use a computer language, code. – Code that has something to do with stars, Milky Way, constellation…etc. I have been looking for and researching by myself and also asking computer software programmers/developers or a computer science professor with PhD. However, this was not easy. To me, they are really a secret code. I cannot read computer languages. The code has to fit my concept and needs to please me esthetically and usable as layer to my art as well as no copyright infringement issue. Then, finally, I got those code samples with a help of one of good friends who has a big interest in astronomy and who is a software developer at the same time. He was a great help, patiently answering my questions (again, I cannot read C language and such) and giving me good suggestions. 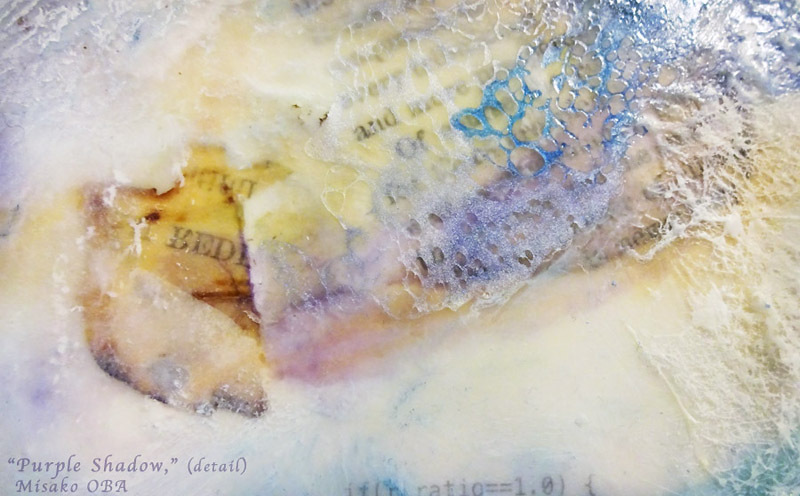 So now, my new work from this series contains both ancient materials such as encaustic paint, the Bible verses AND the contemporary material such as inkjet pigment (transfer) and computer programming language/code. *The Advertisements below are not associated with the post. 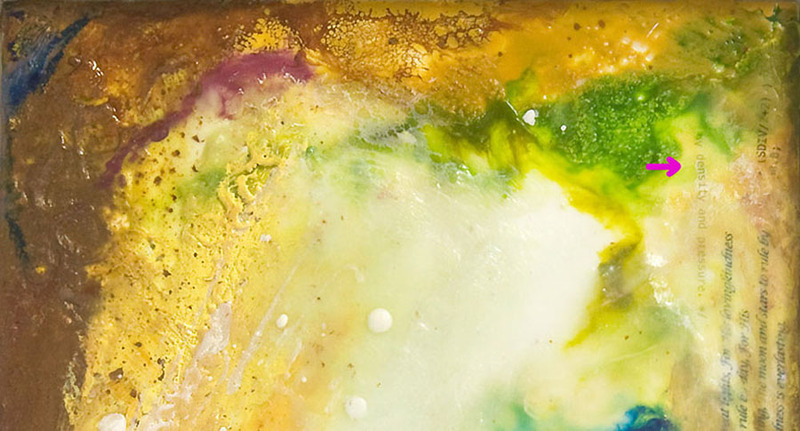 This entry was posted in Creative process, Encaustic, exhibition, Mixed Media, New York, News/Announcement, Quotes, Seattle, Stars and/or Desert, Uncategorized, wax or beeswax and tagged art, collage, encaustic, exhibition, mixed media, New York, Seattle, stars. Bookmark the permalink.